Hi. I have been checking this website for some time now and decided to start my own journal. 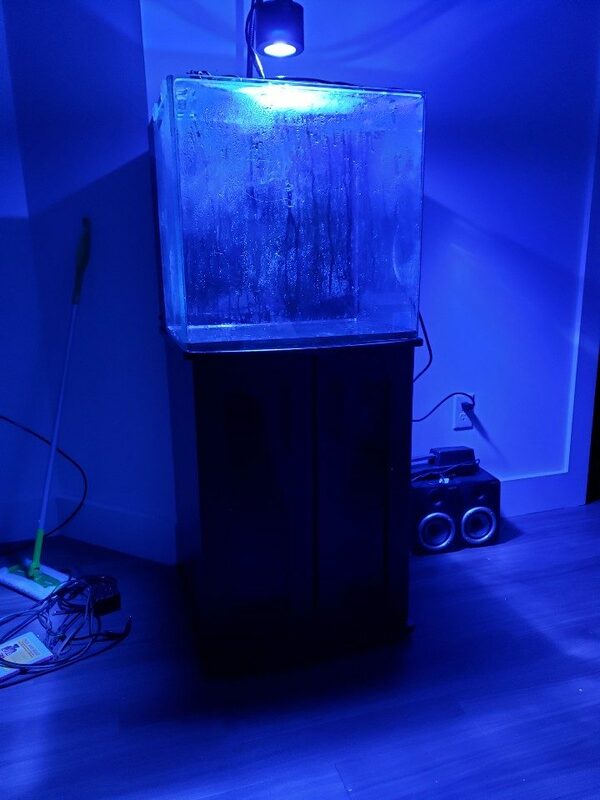 I have had a few freshwater tanks for more than 10 years (10, 20, and 72 gallon). 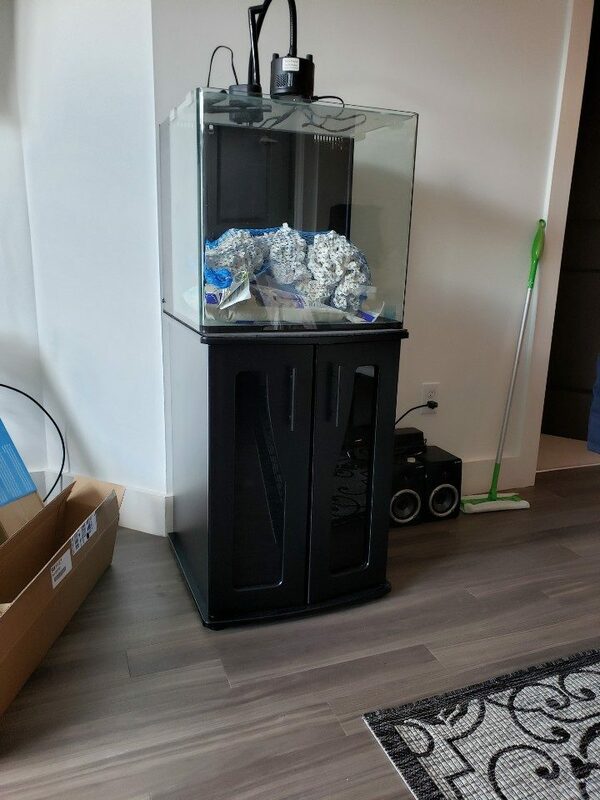 I recently moved to a new place and the lease says fish tanks are not to exceed 10 gallons total so I got rid of my beloved 72 gallon bowfront. 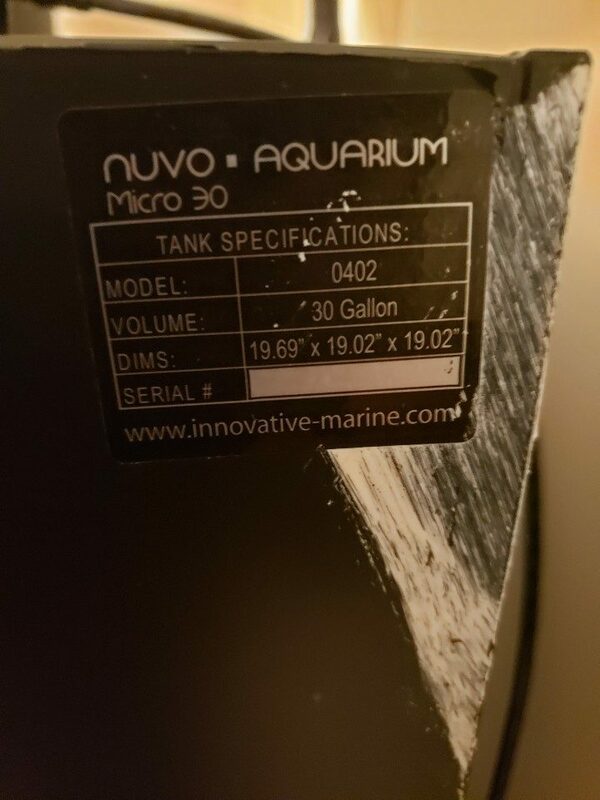 After settling in for about a month, I noticed no tenant abides by the lease (I saw a few pit bulls and dog breeds that they do not allow and recently ran into a guy that told me he has 65 gallon reef tank) and saw a great deal on used Nuvo 30 (cube) with Kessil A360 WE Tuna Blue only for $250 (leak tested before buying). 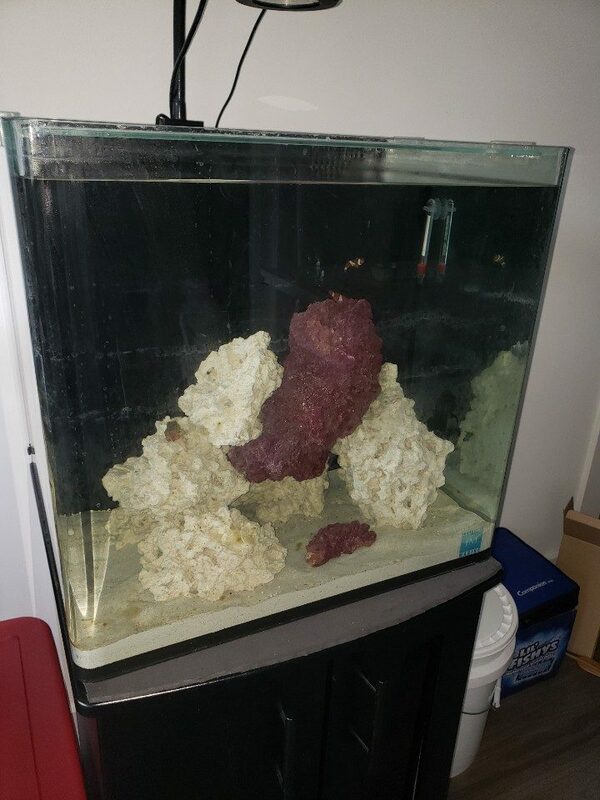 It was just too good to pass and I always wanted to start a reef tank at some point. 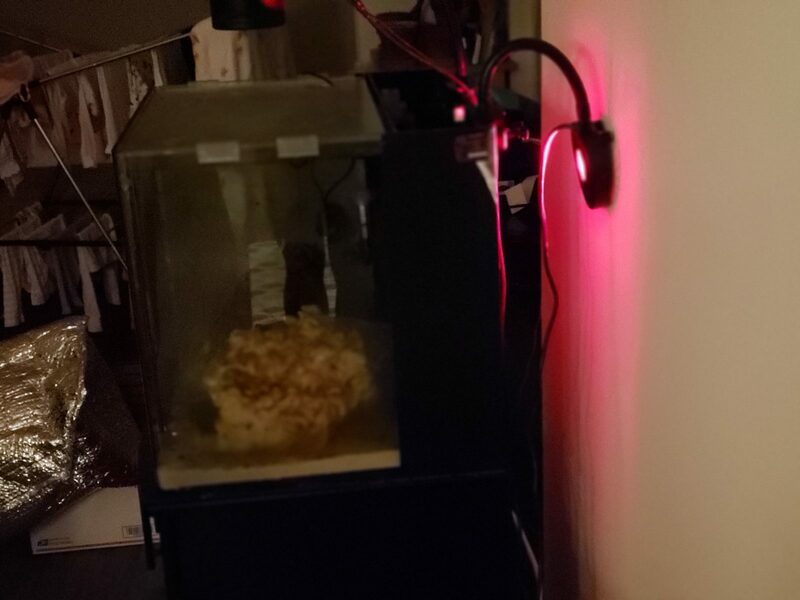 Protein skimmer: need suggestions, probably will go in one of the overflow chamber, Tunze 9001 or 9004? Tank is finally cycled. I had the tank running for 1 extra week after the tank had been cycled just to make sure. In a week or two, will be adding clean up crew from Reefcleaners, Emerald Crab, Porcelain Crab, and Jebao SOW 4. In a month or two, will be adding Fire Fish, Yellow Watchman Goby, Pistol Shrimp, Cleaner Shrimp, and some more corals. 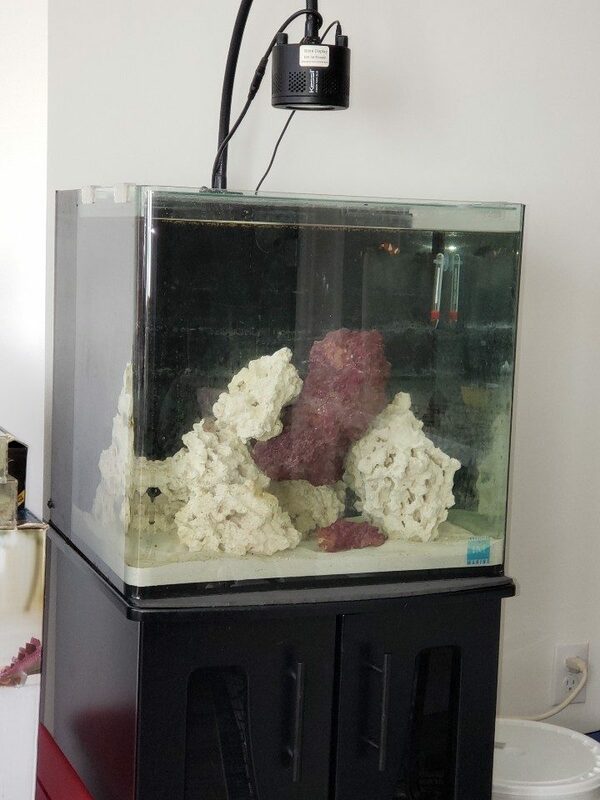 In a year or two, I will be adding Reef Glass Skimmer and Auqa Gadget Reactor. 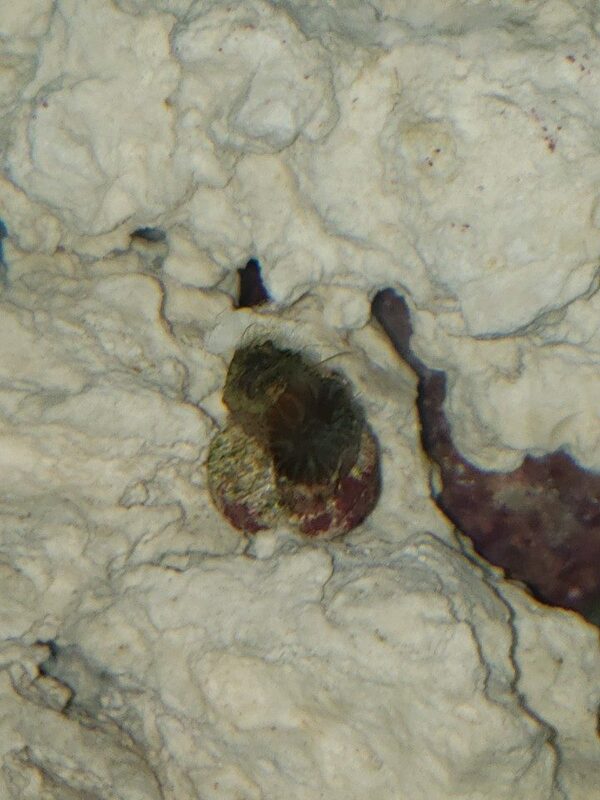 One if the clownfish did not make it. One was out and eating but the other guy was always hiding in the back. On the third day, he laid still and flat. I had the water tested and Nitrite was very high. Maybe cycling was not completed or it was disrupted when I moved the rocks. No more fish for at least a month or so...but the fish that survived looks healthy and is out. I had the water tested and Nitrite was very high. Maybe cycling ﻿was not completed or it was disrupted when I moved the rocks. No more fish for at least a month or so...but the fish that survived looks healthy and is out. An unfortunate fact about this hobby is that it's almost impossible to get into it without killing at least a few animals along the way 😞 Don't feel too bad about it. Some specimens are weakened from shipping, or get stressed out while they are netted and bagged, and simply don't make it no matter what you do. You have a nice tank and it looks like you're off to a good start, so I hope you don't get discouraged! 🙂 Just make sure you keep an eye on your water parameters as you continue to add more livestock. Do you have a basic testing kit for ammonia/nitrite/nitrate? Also I noticed you are not using a heater. Make sure to keep a very careful eye on your tank's temperature, as temp swings from changes in the ambient can be very stressful for your livestock. You might want to check the nighttime temp late in the evening, just to be sure it isn't deviating too far from the daytime average. I do not have a test kit. My LFS does free testing. About a week and a half ago, I had the water tested for Nitrate only. They were closing soon so I felt bad and only tested for Nitrate and I assumed having Nitrate would mean at least cycling is almost completed. I gave an extra week assuming cycling must have been completed since I had appreciable Nitrate then when I tested. I skipped the full test and added two clownfish. I should have been more carefuk and should have tested before adding fish. Now I know I have Nitrite I will definately test before adding anything. As for temperature, my place actually too warm and am worried about temp going up to high, but you have a good point. I should check what the tank temp is at late night. When I check in the morning and in the evening, it is at 78. Thank you for the encouragement. I like this hobby too much for me to give up. Happy Reefing! Had the water tested just to be sure and I had zero Ammonia and Nitrite. It must have been when I was rearranging the rocks and stirred up the sand. Nonetheless, it was good to go.The LFS had $6 a frag sale and I picked up some random coral frags. Stupid phone does not show their true color. They look much nicer in real life except they are really really small. I will probably get a CUC from Reef Cleaners next week. There is enough algae growth and the tank seems stable enough now. The second clownfish just died...it passed a long white stringy feces before it died. The combination of nitrite and parasite probably killed him. This guy was tough though. He lived ten more days than the other guy. The second clownfish just died...it passed a long white stringy feces before ﻿it died﻿. The combination of nitrite and parasite probably killed him. This guy was tough though. He lived ten more days than the other guy. Sorry to hear about the clown 😞 I would not worry about parasites infecting your clean-up crew, but I would definitely wait a good while before adding any more fish. 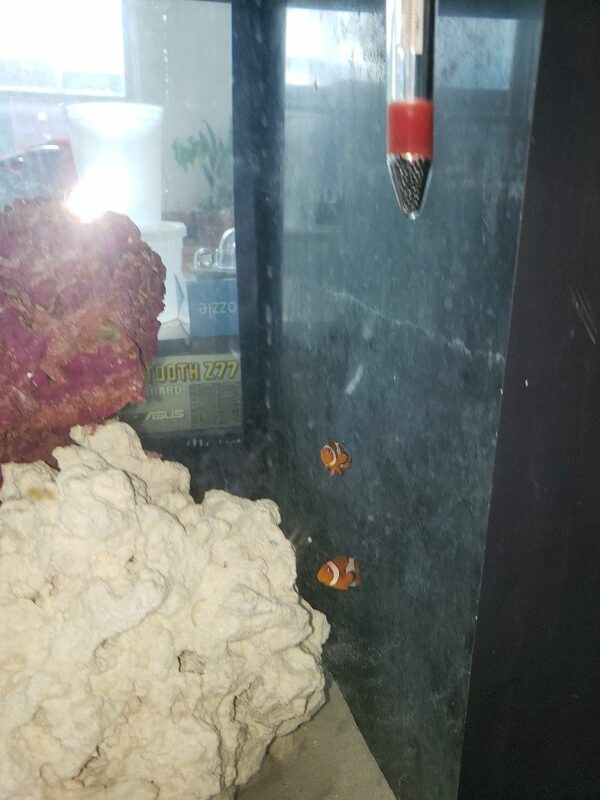 Given enough time you should be able to replace your clownfish safely, but you'll want to make sure that whatever infected the first two has a chance to die off and clear out of your system. Most fish harbor at least a few parasites no matter where they come from, and stressful situations such as being moved from tank to tank can temporarily weaken the fish and allow these parasites to gain a foothold. There isn't really a lot you can do about this beyond offering them the best care and highest quality diet that you can provide, in the hopes that their natural defenses will be able to overcome the bugs on them. In a month or two your tank will hopefully be much more stable, so the next fish you add will have a better chance of doing well. I just went in to a LFS for some RODI water and saw a Hammer coral frag was on sale ($5) and I could not resist. The same LFS is having an anniversary sale in May and that is probably when I will add the clownfish. Ordered a CUC from Reef Cleaners before the clownfish died. The package was supposed to be here on Saturday but it still has not arrived (it is Sunday night now). I hope it gets here on Monday and no DOA. Just received my CUC from Reef Cleaners. It was supposed to deliver on Saturday but USPS screwed up and delivered two days later. Everything came in separate bags and looks like almost everybody made it except a bag of snails and one of the porcelain crabs. The bag of snail had a very funky smell (rotting fish) and porcelain crab was shattered into pieces. I bought four porcelain crabs and only one was shattered into pieces. This bag did not smell at all. Maybe the snails died first and the crab was shattered recently? 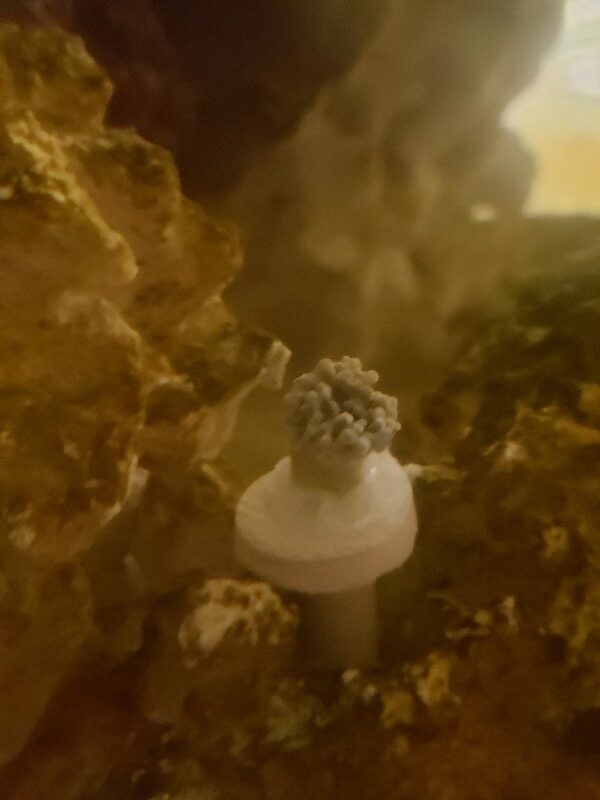 I am probably going to get Chaeto and more stuff from Reef Cleaner so maybe he can ship the replacement with my new order to save on shipping? I blame USPS not Reef Cleaners. The box was packed well. It arriving late is probably what killed the crab and the snails. I'd definitely say it's more than likely USPS' fault. 😄 John at RC is usually very understanding about mortalities and other various problems, so I'd send him a message about it if you haven't already. He'll likely make sure you get plenty of snails next time. John just emailed me now saying he will refund and I replied back offering him to just ship with my next order. Will definately order again from him! Just received my wavemaker, Jebao SOW 4 and my refugium light Kessil H80. Jebao is more quiet than I had thought it would be. I could not really hear anything and had to look at the propeller spin to confirm it was running on the lowest setting. On the highest setting you can hear something but it does not really bother me. 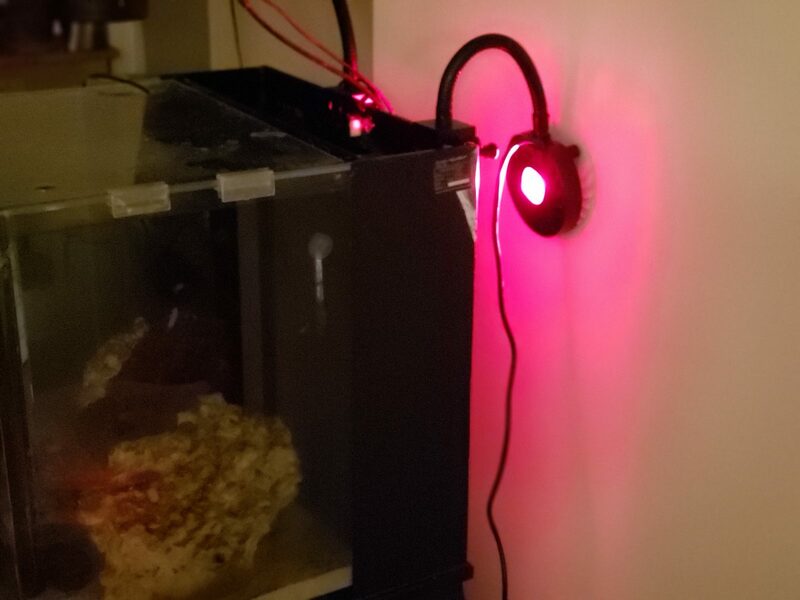 I have to figure out a way to mount Kessil H80 so it is shining the back of my tank. The gooseneck that I came does not look like it is going to work. Once I figure out a way, I am thinking of getting Chaeto and Ulva Macroalgae.